What is a designated national authority? 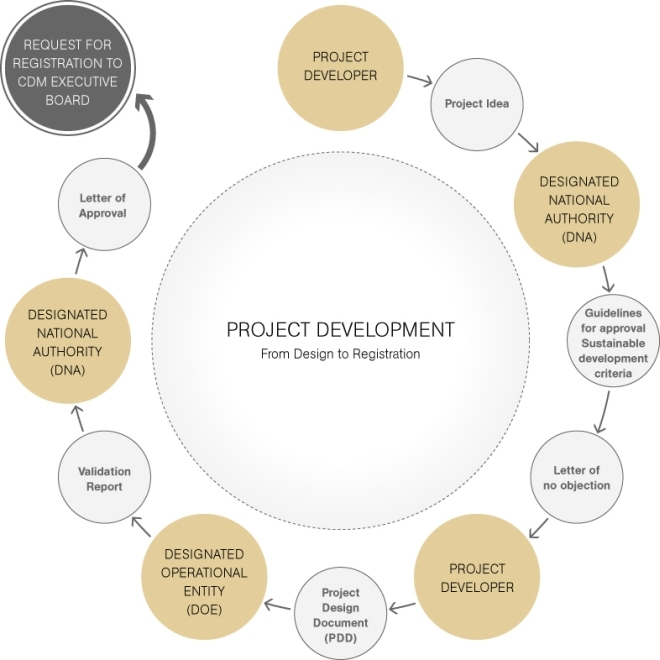 A designated national authority (DNA) is the organization granted responsibility by a Party to authorise and approve participation in CDM projects. Establishment of a DNA is one of the requirements for participation by a Party in the CDM. The main task of the DNA is to assess potential CDM projects to determine whether they will assist the host country in achieving its sustainable development goals, and to provide a letter of approval to project participants in CDM projects. This letter of approval must confirm that the project activity contributes to sustainable development in the country, that the country has ratified the Kyoto Protocol, and that participation in CDM is voluntary. It is then submitted to CDM Executive Board to support the registration of the project. DNAs have additional roles to play, such as the submission of proposed standardized baselines for their country, among others. These responsibilities have increased as the CDM has evolved. As mandated by the CMP, the CDM Executive Board invites DNAs to provide to the UNFCCC secretariat information on practices conducted for local stakeholder consultations. Under the same mandate, DNAs who wish to develop guidelines for local stakeholder consultations in their countries can request technical assistance from the Secretariat. This CMP mandate aims at improving the transparency of the CDM and at helping DNAs put in place processes for complying with this important CDM requirement. At its ninth session, the CMP requested the CDM Executive Board to collaborate with the Designated National Authorities Forum in collecting information on practices conducted for stakeholder consultations. With the support of the UNFCCC secretariat, this information will be published on the UNFCCC/CDM website. Under the same mandate, DNAs who wish to develop guidelines for local stakeholder consultations in their countries can request technical assistance from the secretariat. This CMP mandate aims at improving the transparency of the CDM and at helping DNAs put in place adequate processes for complying with this important CDM requirement, as needed. DNAs can share their local stakeholder consultation practices by sending an email to moderator-dna@unfccc.int. Local stakeholder consultation practices could be sent either in English or in the official language of the country. Once received by the secretariat, these practices will be published on the CDM website. DNAs who wish to receive assistance in monitoring sustainable development benefits of CDM projects in their territory can submit a request to the UNFCCC secretariat. The CDM Executive Board has been mandated by a CMP decision to develop guiding tools for DNAs who might be interested in receiving such assistance. This mandate is expected to enhance transparency of the sustainable development aspect of the CDM. DNAs who wish to benefit from the assistance available can submit a request via e-mail to moderator-dna@unfccc.int. At its ninth session, the CMP requested the CDM Executive Board to develop guiding tools for Designated National Authorities (DNAs) who wish to receive assistance in monitoring the sustainable development benefits of CDM projects and programmes of activities (PoAs) registered in their territory. In recognizing that the use of such guiding tools is the prerogative of Parties, the CDM Executive Board offers such assistance upon the request of host Parties and on a voluntary basis. This CMP mandate aims at assisting host Parties to monitor the sustainable development benefits of CDM project activities and programmes of activities (PoAs) in their territory, thereby improving the reputation of the CDM and enhancing the transparency of the sustainable development aspect of the mechanism. With the aim to assist host parties in monitoring the sustainable development benefits of CDM project activities and PoAs on a voluntary basis, the UNFCCC secretariat would like to invite you to kindly share with us the practices that your DNA has in place for monitoring sustainable development benefits from CDM projects and PoAs, including the indicators used (if any). In case your DNA has not developed yet any provision in this regard, it would be also useful to inform us in order to have a better understanding of the present situation of all DNAs in relation to the monitoring practices of sustainable development benefits. We invite you to share the provisions that your DNA has developed with regard to monitoring of sustainable development benefits from CDM projects and PoAs through the moderator email address: <Moderator-dna@unfccc.int> . + What is a DNA?